You know, you would think blogging about ice cream would be easy. Either you like it or you don't really... no,it's more than just that, plus there are outside factors. Today's outside factor? I was hungry, way too hungry. I inhaled my first serving before I had even formulated a half decent opinion. 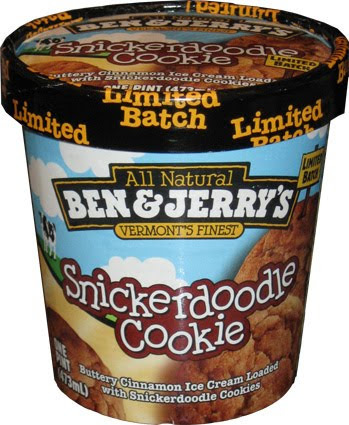 Ok, as always: Here is Snickerdoodle Cookie from Ben & Jerry's. 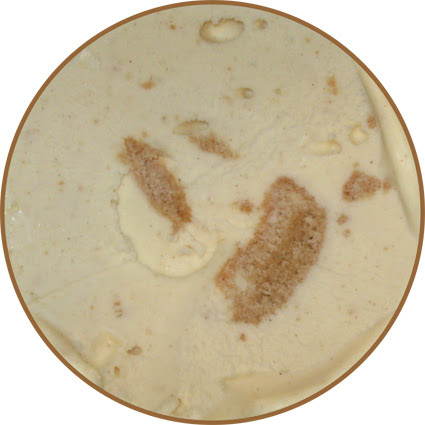 It's Buttery Cinnamon Ice Cream Loaded with Snickerdoodle Cookies. I think Buttery Cinnamon should be in ( )s, but more on that later. Wow, that's a big cookie! Now as I scooped out a serving I couldn't help but take another shot. We have major cookie action going on here. I think this probably qualifies as the biggest cookie bits I've ever seen in a major production ice cream. I mean, they aren't even bits, these are full fledge small cookies and there are alot of them. I think the only think that comes remotely close is that time we went to main and I had Shain's of Maine's Maine Survivor (which was awesome by the way). Now the cookies are soft and pleasant. I know snickerdoodles tend to be more potent, and can be crunchy, but I think I like them this way better. They are mixed with a base ice cream that is typical top notch ben & jerry's quality, but the flavor is well... mild at best. It really is surprising at just how mellow it is. I was so hungry that the overall mellow nature of this flavor had no ability to slow me down. I tried formulating a decent opinion, but I just couldn't. I certainly wasn't wowwed, but I knew I at least liked it. On Second Scoop: Ok, fast forward a few hours to when the lawn is mowed, dinner's been eaten, and it's time for a final snack of the day. I'm ready to go slow and I'm looking forward to something mild and I dig in. Mmmm, it's good and it hits the spot. It's a nice uncomplicated flavor that matches my need to unwind for the day. I'm ready for it and now and it's totally clicking. I will say that Ben & Jerry's has done better, but I like this one and I'm definitely going to recommend you give it a try. I think I'm mostly of your opinion on this flavor. The ice cream base was more of a sweet cream than cinnamon. I too inhaled the ice cream without savoring or taking notes on taste. It was good. Not their best, but definitely worth eating. I like snickerdoodles but butter ice cream makes me want to not eat it.. Thanks! I love snickerdoodles and I can't wait to find this! Do you know how long this will be available? I love your blog! Blue Bell makes a Snickerdoodle ice cream as well which I just saw and picked up at the store for the first time. 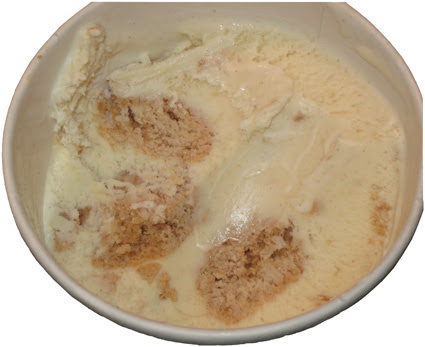 It’s a cinnamon ice cream with chunks of snickerdoodle cookies and a praline-cinnamon swirl. BTW, it was flippin' amazing! It definitely goes down as one of my favorite flavors of all time in my ice cream repertoire. It really sux that you don't get Blue Bell ice cream where you live because it truly is the best IMHO. Well, I have to disagree. This is my favorite flavor from Ben and Jerry's. It KNOCKS ME OUT!!! So good that I eat it everyday...Not kidding. Lowest Calories too. I'm crossing my fingers that it stays!!!!!!! Anyone know how to get it to stay... It was out everywhere here where I live now I cant find it anywhere and it is AMAZINGLY delicious!! I need a stockpile of this stuff! i loved that ice cream but i can't find it no where and im really mad about that. i really think they need to make more like a.s.a.p, i give it 10 stars. I miss this flavor soooo much. It was my absolute favorite! Will it ever come back? I've been looking for this flavor since 2011!!! Every winter I'm thinking I'll get surprised and get disappointed instead!! !